Facebook seems to have finally hit its stride with publishers, as a blog post today announced that average referral traffic from the social network to media sites has increased by more than 170 percent from September 2012 to September 2013. And that’s just on average: Facebook reports that Time‘s referral traffic has increased 208 percent, while BuzzFeed has increased 855 percent and Bleacher Report has increased 1081 percent. Justin Osofsky, VP of Media Partnerships and Global Operations at Facebook, said in a phone interview that he views Facebook’s relationship with publishers like BuzzFeed, Time and Upworthy as a synergistic one: while increased sharing helps publishers drive traffic to websites, higher-quality news items make the NewsFeed a more valuable one — instead of just an endless stream of memes and pictures of babies. Facebook tries to extend the value with a combination of other features, including Facebook embeds and its popular commenting system. Facebook is continuing to build its toolset for publishers as well, releasing a new tool called “Stories to Share.” It’s a bit like Viral for Dummies, enabling publishers to recognize when a particular story is getting big shares within Facebook. 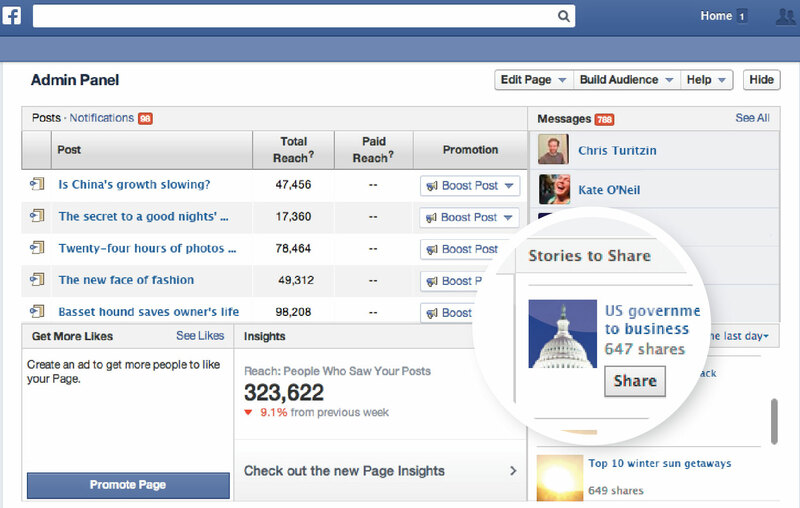 Facebook will mark that story as prime for sharing, and encourage the user to distribute it among fans. While the numbers certainly show an overall improvement in Facebook as a referral source — likely cementing it more as a must-do for Community Managers or burgeoning websites — it doesn’t change the fact that not all news benefits from social media. The outlets that Facebook points to that have experienced exponential growth — BuzzFeed, Time and BleacherReport — have content that is primed for viral sharing specifically on Facebook. It’s unclear how much of the traffic increase should be credited towards the work that the publisher is putting out versus the environment that Facebook provides (though SimpleReach reports that the company is responsible for 61 percent of traffic referrals, compared to Twitter’s 27 percent), but it’s certainly better than if Facebook was actively working against publishers. Perhaps the most valuable piece from this announcement is that it underscores the value Facebook sees in bringing real news to the NewsFeed. As long as that continues, gains are to be had on both ends. Fb is amazing. Google should retire google+.